He began his musical studies at the Musical Union of his hometown (Carlet-Valencia/Spain) and when he was 11 he started playing the horn with D. Manuel Campos. Later he studied with teachers D. J.J. Llimerá and D. J. Rosell. He got Elementary Honorable Mention of Grade and a scholarship from the Santiago Lope Foundation (Valencia). He has done courses with teachers like: Zarzo V., F. Burguera, J. Molnar, D. Clevenger and E. Terwilliger, who Mr.Bernardo is working with since 1995. He has also studied natural horn with : J. Renteria and T. Van Der Zwart. He has also been specialist professor in “Analysis and Musical Interpretation ” at the University of Oviedo. Currently he is Professor of International Music Academy High Performance “Maurice André” of Lliria. In August 1989 he played as horn soloist in the “Banda Municipal de Bilbao”, and from August 1990 to October 2004 was horn professor of the “Symphony Orchestra of Bilbao”. In season 2005-2006 was first horn of the Symphony Orchestra of Navarra – Pablo Sarasate. He has performed with conductors such as Yaron Traub, Günter Neuhold, García Asensio, Manuel Galduf, Gilbert Varga, Ros Marbá, Enrique Diemecke, Juanjo Mena, Andrass Schiff, Junichi Hirokami, Lorin Maazel, Zubin Mehta, Valery Gergiev, Vasily Petrenko, Christian Vasquez, Gianandrea Noseda, and Ricardo Chailly among others. 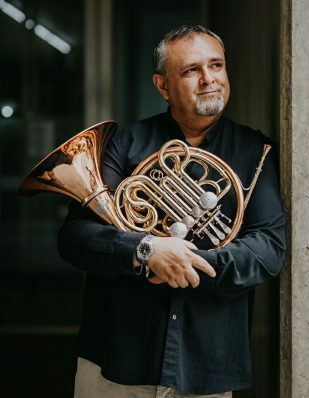 Since Orquestra de la Comunitat Valenciana has been founded (September 2006) he is resident soloist of french horn of “Palau de les Arts Reina Sofia”. And from 2013-14 is Chair Professor of French Horn at the Superior Conservatory of Aragón-CSMA. Nowadays he is Stomvi artist and he plays with the new horn Stomvi “Titan Five” which development he has helped with.